It’s time for another Secret Recipe Club reveal, This month I got the blog Cupcakes with Sprinkles. Meghan seems to love lemon desserts as much as I do, but I decided to go in a different direction for this month. This is the second month in a row I’ve made chocolate and peanut butter for SRC. Until I made these I had never made Muddy Buddies. Once a couple of Christmases ago I made Poppy Chow which is made with popcorn and is a play on the other name given to Muddy Buddies, Puppy Chow, but I’d never used the cereal. Place cereal in a medium bowl and brownie mix in a zip top gallon bag. Melt chocolate chips and peanut butter in the microwave, stirring every 30 seconds, or in the top of a double boiler over simmering water. I used the double boiler method because my microwave burns chocolate no matter how careful I am. Pour the chocolate and peanut butter over the cereal and stir well to coat all the pieces. Pour the cereal into the bag with the brownie mix, close and shake to coat. Spread on waxed paper to cool. Store in an airtight container. They are amazing. I was a bit weirded out with the dry brownie mix because I was afraid it would taste too much like flour but it works really well. 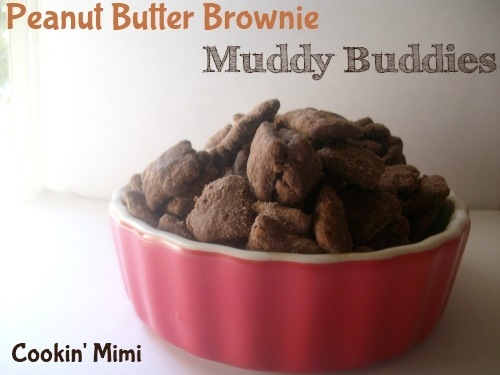 I have a few more muddy buddy ideas floating around in my head. Those look dangerously addicting and delicious. They are. I’ve already discovered I cannot have all the ingredients on hand. Far too tempting. Hi!!!! So I got partnered with you this month and made your AMAZING Mexican Rice!!!! Your blog is incredible – saved so many recipes for later! I loooove muddy buddies! Such a classic, fun treat. Yummy! Wish I had some of these to snack on right now… they look delicious! Great SRC pick! What an absolutely fun thing to make with kids. I can’t wait to try.